After a long lie in, Alex, Will and I discussed options. The day was due to be punctuated by trips to the beautician (Danda, not us) and to the barbers, which limited our travelling options. Unfortunately, the two-woman barbershop in Redcliff was unable to handle more than one person at a time, which meant that Will had his haircut at 12.30pm and mine was at 4.30pm. The 945 metre Gondola ride gently lifts visitors, in the comfort of 4 person passenger cabins, almost 500 metres (1500 feet) above sea level. Unique 360 degree views of Christchurch, the Canterbury Plains and Lyttelton Harbour unfold as you rise to the summit complex, on the crater rim of Christchurch’s famous extinct volcano. 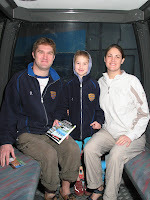 This was Will’s second trip in a Gondola (the first was in Singapore to Sentosa), so he was an old hat. and when the first Maori settlers arrived in dug out canoes, they named the land ‘the great storehouse’ due to the abundance of natural food.